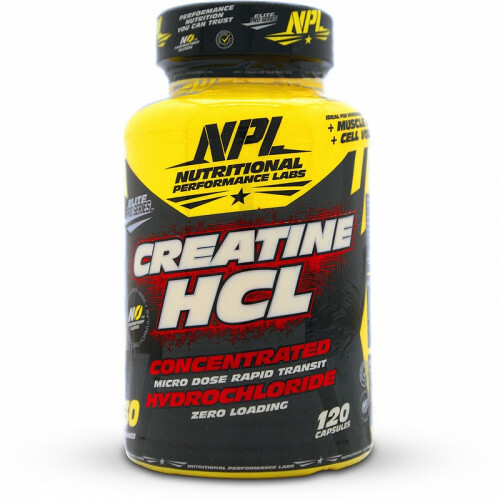 NPL Creatine HCL is a concentrated creatine for muscle growth and endurance. Athletes have used creatine for many years to improve workout performance and lean muscle. Growth is achieved by increasing muscle cell volume by hydrating it with water which causes an anabolic response. Strength during your training is increased by saturating your muscles with a high energy compound called creatine phosphate. This is needed when doing explosive power movements such as weight training. Recovery time is shortened by the same energy compound which is ‘recycled’ quicker, topping up your energy reserves sooner giving you more endurance. This is a perfect caffeine-free alternative to pre-workout products, especially if you train at night with the pre-workout interrupting your sleep because of the caffeine content. With no loading phase necessary and taken approximately 15 minutes before your gym session this is perfect if you want an almost immediate performance boost but without the stimulants. NPL Creatine HCL is available in 30 servings each dose provides a full 3 grams of Creatine HCL with Bioperine added for maximum absorption. This workout performance booster is an inexpensive and valuable muscle builder that no athlete should train without. Other Ingredients: Gelatine, Magnesium Stearate, Silica. This product is manufactured in a facility that uses materials containing Milk, Wheat, Egg, Fish, Peanut, Shellfish and Tree Nuts. • Take 4 capsules with 250ml of water. • Use 15 – 20 minutes before your workout. • On non-training days take 4 capsules on an empty stomach first thing in the morning. • Be sure to drink at least 2 to 3 litres of water per day while using this product. Consult your doctor prior to use. Not intended for use by persons under the age of 18. Do not use if you are pregnant or nursing unless prescribed by a sports physician / dietitian. Maintain an adequate state of hydration during use.